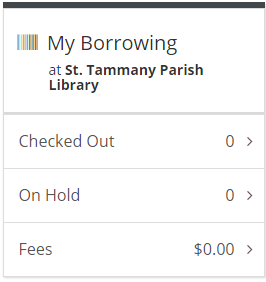 You can view your checked out items and renew them, review your items on hold and see your library fees in My Borrowing. While logged into your catalog account and click on your username in the upper right corner. 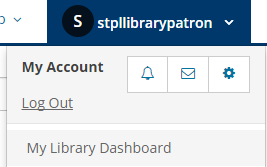 Click on My Library Dashboard. The My Borrowing menu will be on the left. By clicking on Checked Out, you can see the items currently checked out to the card and renew them as well. On Hold will allow you to view your items on hold as well as pausing and canceling holds. Fees will allow you to view your fees and pay them online.